All real estate agents and brokers now have access to free, general performance metrics for their realtor.com listings. Brokers and agents have access to listing performance data from an increasing number of portals, giving them the opportunity to make smarter decisions around syndication and marketing. Realtor.com advertisers get more granular listing performance data. 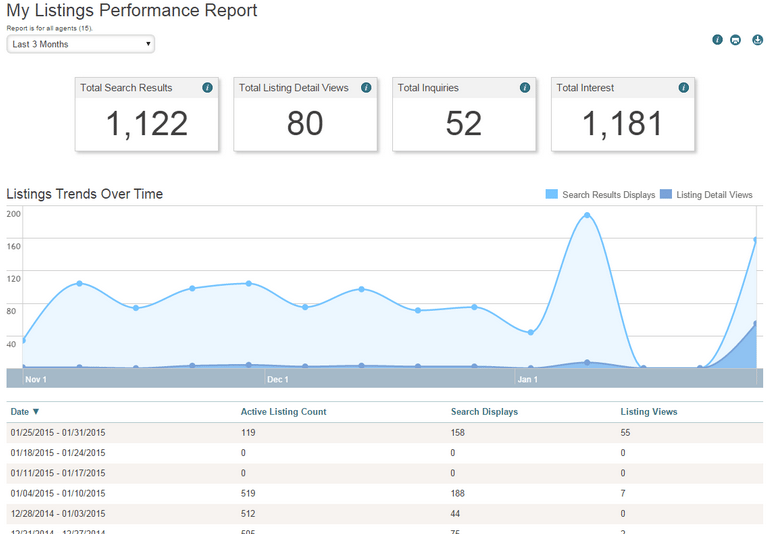 Real estate brokers and agents now have access to general performance metrics from their realtor.com listings, including the number of listing detail page views they receive, how many times they show up in search results, how many leads they generate and how many impressions they register. Listing agents get access to a “home seller report,” which provides the number of impressions and pageviews for individual listings for the previous 12 weeks that they can share with their sellers. Previously, only brokers and agents who paid to advertise with the portal had access to this type of performance data. It rolled out of the new “Member Value” reporting metrics feature in August. Brokers and agents have access to listing performance data from an increasing number of real estate search portals, giving them the opportunity to become smarter around syndication and marketing. The data can help users tease out where to get the most bang for their marketing buck, prove to sellers how well agents are promoting their homes and discern which sites provide the best exposure. Earlier this year, Zillow Group began making listing data available to brokers who shared their listings through the Zillow Data Dashboard, including search result impressions, total listing views, and total leads delivered. In March, the firm launched its “Zillow Tech Connect: Reports” initiative, which makes listing performance data available to brokers and agents through third-party firms like ListTrac from the sites it owns or powers, including Zillow, Trulia, Yahoo Homes and AOL Real Estate. Launched in 2013, ListTrac allows brokers and agents to compare the number of impressions, leads and shares their listings receive across a number of portals, including Zillow Group sites, their own websites and MLS sites. For the reporting to work, MLSs must partner with ListTrac, which plans to make money by selling agent and consumer behavioral data. The report shows data at the weekly level. Brokers and agents can choose to see information just from the current month or expand the view to the most recent month, the last three months, the last six months or the last 12 months. Brokers and agents who pay for realtor.com’s Showcase Listing Enhancements product get more fine-grained listing performance information, such as metrics at the daily level and consumer inquiry information for individual listings, among other perks. Sample realtor.com “Member Value” listings performance report. Broker-level reports show aggregate data for all listing agents in a firm. After logging into realtor.com, agents can access the reporting metrics by selecting “Listing Reports” under the “Reports” tab. See a realtor.com frequently-asked-questions document about the new reporting here.